You will often hear people referring to a W124 or an R107 and perhaps wonder what it’s all about. Mercedes-Benz assign a development code to each model, consisting of a letter and three numbers. The most common letters are R for roadster and W for wagen (saloon), though they are not always consistently applied, even by the factory. There are others e.g. 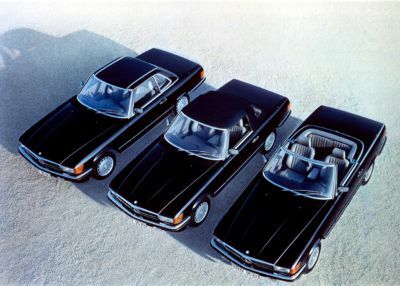 S for estate, V for stretched limo, C for coupe and A for cabriolet (a cabriolet is a four seat convertible, and the name dates back to the era of horse-drawn carriages – not many people know that). The numbers don’t have any meaning, being simply a referential numbering system. There are gaps, presumably for development models which never made it to production. The above references are not really intended for public consumption, though enthusiasts use them to differentiate between the vast array of subtly different configurations which exist. The designations intended for general public use are those inscribed on the bootlid badge of each car. Generally there is a three figure number which usually (though not always) represents the approximate engine size, followed by one or more letters which represents the model class and, if not a four-door saloon, the body style. Just to complicate things further, the letters were moved to the beginning in around 1993 and the body style letter was deleted.